From a supplement protecting against neurodegeneration, to a study indicating the juice can reduce brain damage in embryos, pomegranate research is peaking in Israel. The regal-looking pomegranate, ruby-red with a crown on top, ripens on Israeli trees just in time to decorate Jewish New Year holiday tables in early autumn. Each fruit has hundreds of edible juicy seeds, called arils, traditionally equated to the 613 commandments in the Torah. But pomegranates are appreciated across the world, any time of year, as evidence keeps mounting about their healing and health-protective properties. “The juice from the seeds is very rich in antioxidants, vitamins and minerals,” says Esther Frumkin, a Traditional Chinese Medicine herbalist, nutritional counselor and macrobiotic cooking teacher in Israel. GI distress, hot flashes, hemorrhoids, conjunctivitis, osteoarthritis, hypertension and high cholesterol are some of the ailments pomegranate seeds can ease. They guard against disease – even cancer and heart disease — by boosting immunity and reducing chronic inflammation. Frumkin says pomegranate rind tea can treat diarrhea, dysentery, mouth sores and throat irritation, while pomegranate bark tea kills intestinal parasites. Five years after ISRAEL21c’s highly popular story “Top 10 great reasons to love the pomegranate” first appeared, we talked to Israeli scientists to discover three important new reasons why the pomegranate is the crown jewel of all fruits. Experimental neurologist Ruth Gabizon from Hadassah University Medical Center in Jerusalem bought a pomegranate-seed-oil face cream from Israeli cosmetics maker Lavido. She loved its effect on her skin and found out the active ingredient in the oil is punicic acid, an exceptionally powerful antioxidant. She wondered how this polyunsaturated fatty acid (also known as Omega 5) might help her lab mice, engineered to be predisposed to developing Creutzfeldt-Jakob disease (CJD), a fatal neurodegenerative disorder. 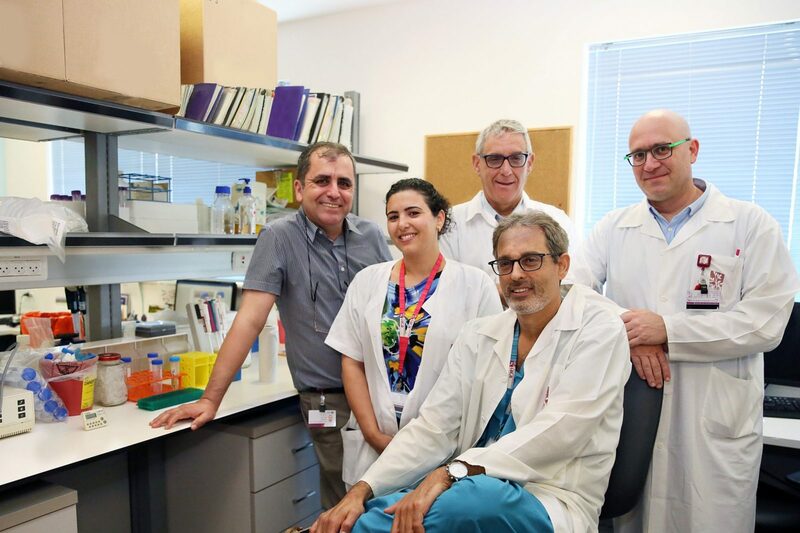 Hoping to prevent the oxidation that causes permanent neuron damage triggering such diseases, Gabizon had been seeking a safe, inexpensive lipid-based antioxidant to protect brain cells. Punicic acid seemed a good candidate. “I came into my lab one morning and said to my students, ‘We’re going to give this to our transgenic mice,’” Gabizon tells ISRAEL21c. Her idea grew into a collaboration with award-winning nanotechnology expert Shlomo Magdassi of the Hebrew University’s Casali Center for Applied Chemistry to formulate punicic acid in a new way to get past the blood-brain barrier. Their company, Granalix, markets the novel formulation as a food supplement called GranaGard with FDA-approved ingredients. Since late 2016, GranaGard has been sold worldwide through the Granalix website and in select Israeli pharmacies. It is distributed in Mexico and soon in Greece. Manufactured by Israel’s SupHerb as a soft gel cap, GranaGard contains mostly Israeli-sourced pomegranate seed oil, found to have a particularly high percentage of punicic acid. “This is a science-improved natural compound tested as a drug but treated as a food supplement,” says Gabizon. She and Magdassi take it for general wellbeing and believe it can help prevent neurodegenerative conditions without side effects. She emphasizes that such diseases can’t be cured, only prevented or slowed. Clinical studies are looking at the effect of GranaGard in people with early multiple sclerosis and memory problems. A group of CJD carriers has taken GranaGard for two years. “While still a very short time, it’s encouraging that they haven’t developed the disease yet,” says Gabizon. Drinking pomegranate juice appears to reduce the risk of embryos developing brain damage, according to a new joint study by researchers from Haifa’s Rambam Health Care Campus and the Technion-Israel Institute of Technology, just published in the American Journal of Obstetrics & Gynecology. A significant proportion of premature births occur due to infection and/or inflammation in the uterus, which previous studies have shown to be a risk factor linked to brain injury and the development of neurological deficits soon after birth or later in the child’s life. Therefore, scientists have been trying to find harmless ways to reduce these risks during pregnancy. “Studies have shown that pomegranates are rich in polyphenols, a type of free-radical-neutralizing compound known to have strong antioxidant and anti-inflammatory effects,” explained Dr. Ron Beloosesky, director of the Prenatal Ultrasound Unit at Rambam, referring to the groundbreaking research of Dr. Michael Aviram, former director of Rambam’s Clinical Research Institute. The study was conducted on pregnant lab rats in Beloosesky’s Prenatal Research Laboratory at the Technion. Rats that received pomegranate juice in their drinking water for several days before an induced inflammatory process showed decreased inflammation and a significant reduction in signs of inflammation and injury to their babies’ brains when compared to those that didn’t drink the juice. “It seems that an accessible and inexpensive juice that can be found in any supermarket has a positive effect on a serious problem that harms mothers and their embryos,” said Beloosesky, adding that this was a preliminary study and the research team is now doing in a study on humans, expected to be completed in the next two years. 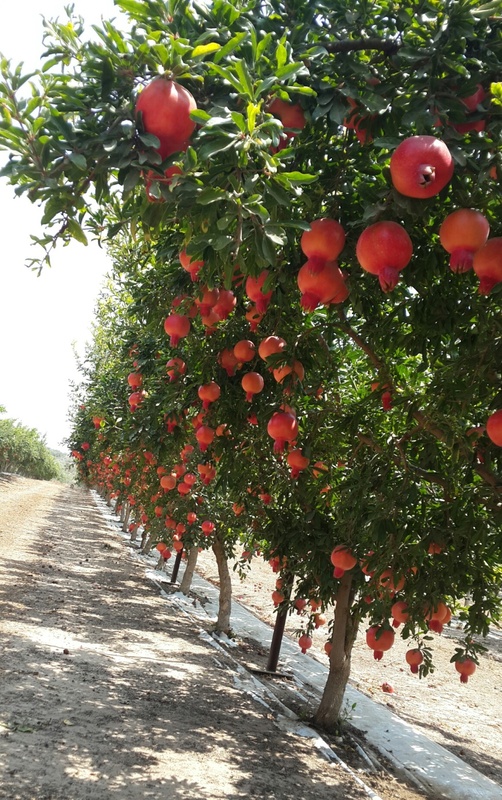 Agronomists from many countries turn to Israeli experts for advice on pomegranates, says Doron Holland, head of fruit tree sciences at the Volcani Center-Agricultural Research Organization’s Newe Ya’ar Research Center. “Our cultivars are being grown all over the world. They are highly valued in Europe and there is growing interest in our cultivars in North America,” Holland tells ISRAEL21c. What makes the Israeli cultivars so special? “The metabolites in pomegranates are anti-inflammatory, antimicrobial and antioxidant, and highly beneficial for humans. These metabolites are mostly produced in the skin rather than the arils. We look for ways to produce more of these metabolites in the arils,” explains Holland. Because metabolites are responsible for the deep red color of the fruit, enhancing them makes the produce more marketable as well as healthier. Israeli pomegranate cultivars also excel at producing fruit with soluble tannins, a beneficial substance unique to pomegranates, Holland says. Much of that substance, like the other metabolites, is in the skin. The Volcani Center found a way to use those nutrient-dense but inedible skins – normally thrown away — as animal feed. Holland says Israeli farms from north to south produce around 40,000 tons of fresh pomegranates every year, at least half of which gets exported, mainly to Europe. Thanks to cultivars developed by Holland’s team, the first export of fresh fruit now starts as early as mid-July.